During half term eighteen GCSE and A-Level students took part in a study visit to Berlin. Whilst in the German capital, the group enjoyed a wide range of activities that exposed them not only to the language, but also the city’s culture and turbulent political history. 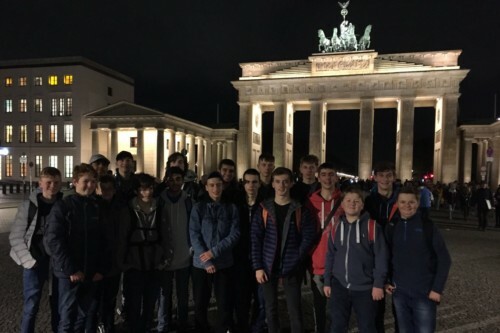 The trip started with a chance to see the most famous sights by night, including the Brandenburg Gate, Reichstag building and the state-of-the-art main railway station. The first full day included a trip to a panoramic viewing platform, the 1936 Olympic stadium and a visit to the Currywurst (curry sausage) museum that included a free sample of the popular Berlin delicacy. No trip to Berlin would be complete without a visit to the Berlin Wall visitor centre, where the students were able to fully appreciate the physical divide that existed between East and West Berlin. Our final day was spent in nearby Potsdam – a small city with an incredible history. Our bus tour took in the varied architecture, the Bridge of Spies and the palaces of the royal park Sanssouci. The boys learnt more about the city centre whilst completing a town trail, which also allowed them to sample a few more German specialities. Evening activities included a film night and pulsating ice-hockey game. A good time was had by all, and it was great to see the pupils’ interest in the language and culture grow to the next level as the trip progressed. I hope they are keen to return to Germany very soon!